The Guptas rose to national infamy when a commercial airliner packed with guests for a family wedding was allowed to land at Air Force Base Waterkloof in 2013, sparking an onslaught of public outrage. Since then, they have become embroiled in allegations of state capture, of dishing out cabinet posts to officials who would do their bidding, and of benefiting from lucrative state contracts and dubious loans. The Republic of Gupta investigates what the Gupta brothers were up to during Thabo Mbeki’s presidency and how they got into the inner circle of President Jacob Zuma. It shines new light on their controversial ventures in computers, cricket, newspapers and TV news, and coal and uranium mining. And it explores their exposure by public protector Thuli Madonsela, their conflict with finance minister Pravin Gordhan, and the real reasons behind the cabinet reshuffle of March 2017. 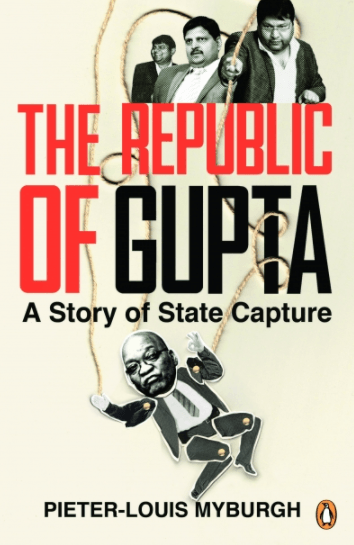 Pieter-Louis Myburgh delves deeper than ever before into the Guptas’ business dealings and their links to prominent South African politicians, and explains how one family managed to transform an entire country into the Republic of Gupta.